If you have been following this blog and my website – http://www.malaphors.com – you know that the sports world is a gold mine for malaphors. This beauty was heard on a local sports radio talk show (Pittsburgh). A guy was talking about the Pirates and criticized the organization for focusing exclusively on “ingrown players” rather than seeking free agents. This is a congruent conflation of “home-grown” and “in-house”, both meaning something local or conducted within the organization. 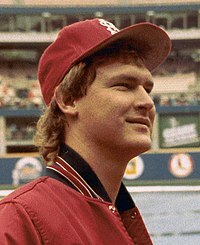 Just wondering, but was Tom Herr, the second baseman for the St. Louis Cardinals, an in-grown ballplayer? A big thanks to Justin Taylor for hearing this one and passing it along!